Enhance the capabilities of the Rocket M base stations with Sector AirMax 3G18-120. The Sector AirMax 3G18-120 antenna is created to work perfectly well with the Rocket M base stations. This then transforms the latter into a point-to-multipoint wireless networking system, providing Internet throughput to several other devices and users who can be located in various areas that are within the scope of the antenna. The base stations may also be used to communicate with other wireless networking devices from Ubiquiti Network such as access points and satellite dishes. The Sector AirMax 3G18-120 antenna is one of the least complicated devices. All the items you need for proper installation such as the mating mounts and the RF jumpers are already included in the package. Moreover, since it’s designed to complement the Rocket M base stations, both can be attached through a snap option. The entire process doesn’t require any special tools and in-depth knowledge on installation and configuration. You can also have the antenna up and running and broadcasting signals in less than an hour. The antenna has a dimension of 700 by 145 by 93 mm and is at 5.9 kg. As an outdoor device, it is very important that the sector antenna is not only durable but is also very stable. The RF jumpers are weatherproof, guaranteeing they can protect your system from any undue damage. The antenna also has a wind load of 160 miles per hour, allowing it to sustain itself even when there’s storm in the area. It is built for harsh weather conditions. 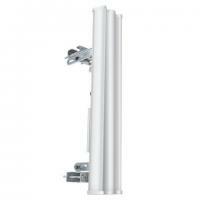 The Sector AirMax 3G18-120 is a dual-linear antenna that maximizes both the Internet and wireless performance. It also uses MIMO technology to ensure its good communication among devices. It works on a bit higher frequency range, from 3.3 to 3.8GHz. The gain is currently at 17.3 to 18.2 dBi, with a cross-pol isolation rate of 28dB minimum. The H-pol and V-pol beam width are 118 degrees and 121 degrees, respectively. The elevation beam width is 6 degrees while the electrical down tilt is 3 degrees. Cross-Pol Isolation: 28 dB Min.